Hello there! 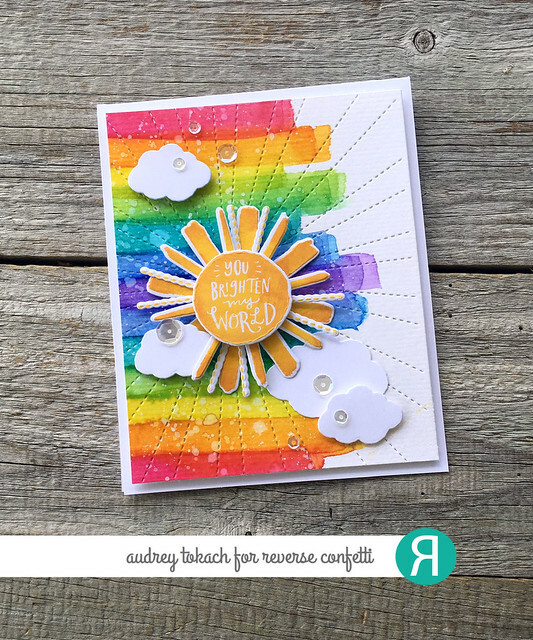 I am bringing you rainbows and sunshine today using goodies from Reverse Confetti! To create my card, I started by watercoloring rainbow stripes onto a piece of watercolor paper with my Distress Inks. I used a 1/2" flat brush, slightly overlapping each other with the next, and drying each stripe between layers. When it was dry, I diecut it with the Stitched Rays Cover Panel Confetti Cuts die. I stamped all of the layers of the sun from the My Sunshine stamp set in Sunshine ink and diecut them with the coordinating My Sunshine Confetti Cuts dies. I added foam tape between each layer and popped it up in the center of the rays. Then, I diecut some clouds using the Take Flight Confetti Cuts dies. To finish off the card, I added a scattering of clear sequins. Hello there! 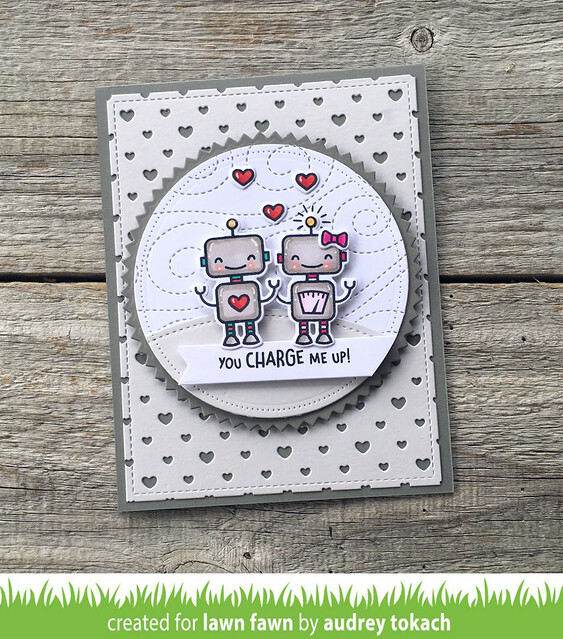 Today, I have a fun card to share with you using the new exclusive Charge Me Up: Light Up Cardmaking Kit from Lawn Fawn and Chibitronics! I used the adorable robot mini stamp set that is included in the set. It can be used with or without the circuits to create such cute scenes! To create my card, I started off with an A2 Narwhal cardstock base. Then, I diecut a piece of Fog cardstock with the Polka Heart Backdrop: Portrait die and again with the largest die from the Outside In Stitched Rectangle Stackables dies. For the focal point, I diecut the largest circle from the Zig Zag Circle Stackables from Narwhal cardstock, and a slightly smaller circle from white cardstock I ran the white circle through my diecut machine using the Stitched Windy Backdrop to add some texture. I grounded my robot couple with a Simple Stitched Hillside Border cut from Fog cardstock. I stamped and colored pair of robots using the stamp set from the kit, and popped them up. The sentiment, also from the set, is stamped on an Everyday Sentiment Banner diecut and popped up underneath the robots. 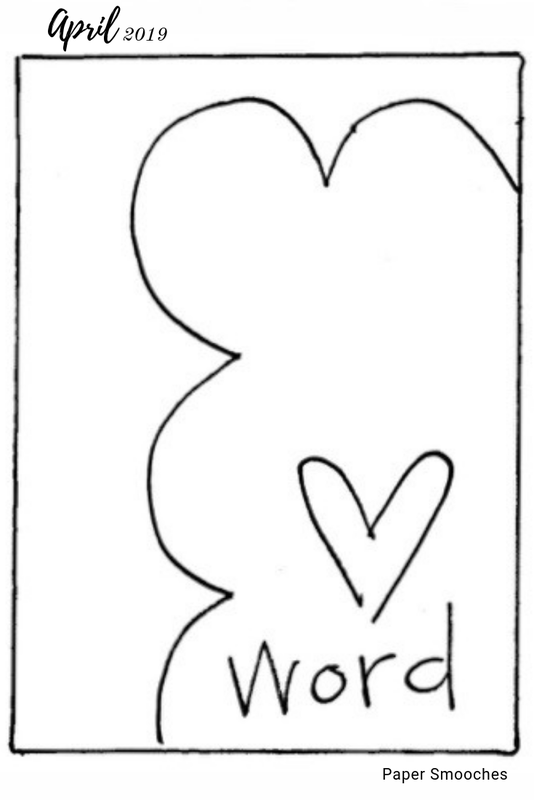 To finish things off, I added a trio of tiny hearts and some white gel pen accents. That's all for me today! 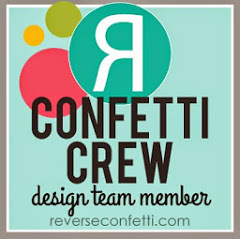 Be sure to check out the Lawn Fawn blog from lots more inspiration from the design team! 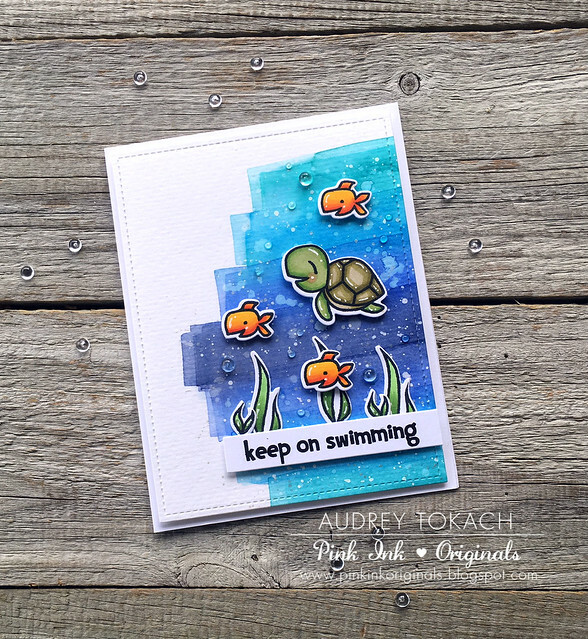 Paper Smooches April Challenge & SSS Wednesday Challenge! To create my card, I started off by watercoloring several layers of stripes using a 1" flat brush and Distress inks in Peacock Feathers, Salty Ocean, Blueprint Sketch and Chipped Sapphire. I painted each stripe and dried it between layer before painting another over top. I also added some white pearl watercolor splatters and splatters with white acrylic paint. When it was dry, I diecut the panel with the Lawn Fawn Outside In Stitched Rectangles dies. I stamped and colored images from the Courteous Cuties stamp set with my Copic markers and diecut them with the coordinating Courteous Cuties Icons dies. I arranged the scene on the panel and popped everything up with foam tape. The sentiment is from the Courteous Cuties 2 stamp set and it is stamped on a banner diecut from the Bannerific Dies set. To finish things off, I added some white gel pen accents, some clear droplets from my stash, and a few smaller bubbles using Nuvo Morning Dew drops. Hello there! 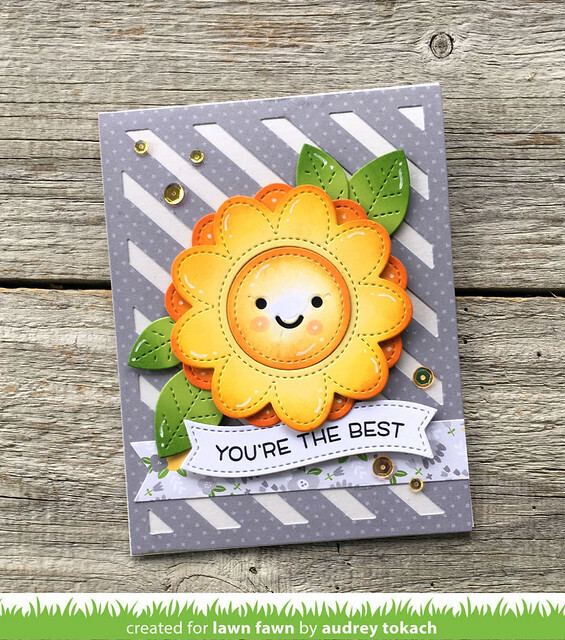 Today, I have another card to share with you using goodies from the Lawn Fawn Spring release as Inspiration Week continues! My card today features the gorgeous new Fancy Lattice Backdrop die. To create my card, I started off with a white A2 card base. I diecut the Fancy Lattice Backdrop from white and layered that on top using the glue tube. Then I diecut the largest butterfly from the Layered Butterfies die set, with the outline layer cut from white and the solid layer cut from Pixie Dust Glitter Cardstock. I glued those layers together and popped the butterfly up with foam tape. 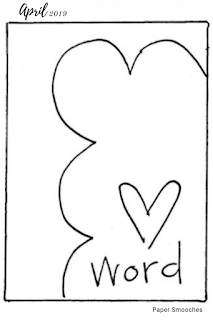 Then, on a Fancy Wavy Banner diecut, I stamped a sentiment from the new Wavy Sayings stamp set in Manatee ink. To finish off my card, I added some iridescent gems. That's all for me today, but be sure to stop by the Lawn Fawn blog to see lots more from the design team! Hello there! I'm back with another project for Lawn Fawn Inspiration Week! Today, I am sharing a card using the new Simply Celebrate Spring stamp set! 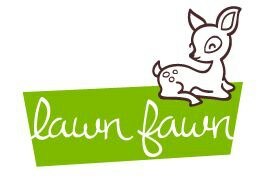 It is scaled perfectly to work with some of my other Lawn Fawn favorites! To create my card, I started off with a horizontal A2 white card base. On top of that, I layered the Itsy Bitsy Polka Dot Backdrop, also diecut from white. To ground my focal point, I diecut a piece of the new Really Rainbow Scallops 6x6 paper and matted it with the Fancy Scalloped Rectangle Stackables. 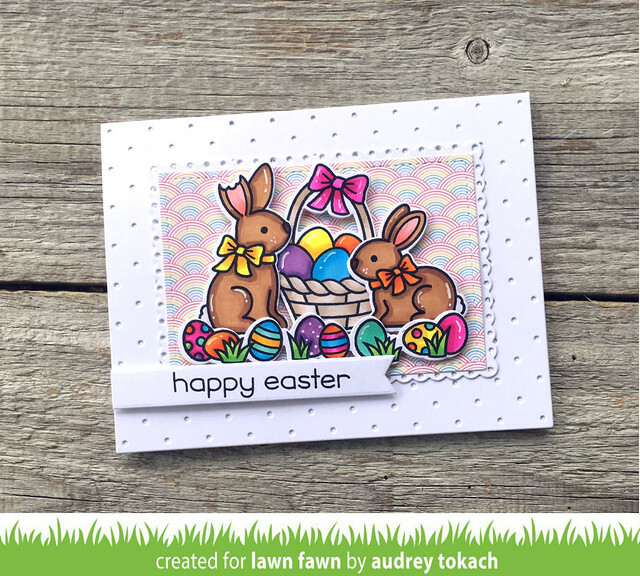 I stamped and colored the Easter Eggs border from the Simply Celebrate Spring stamp set and diecut it with the coordinating dies. Then, I pulled out one of my previously released favorites, Eggstra Special Easter, and colored those images with the same colors. I popped everything up with foam tape, and stamped a sentiment from the Eggstra Amazing Easter stamp set on to an Everyday Sentiment Banner diecut. I finished things off with some white gel pen accents. Hello there! I'm back with another project today as Lawn Fawn Inspiration Week continues! Today, I am using the new Stitched Flower Frames and Outside In Stitched Flowers. I started off with an A2 card base cut from the new Fog cardstock. Over top of that, I layered a Stripey Backdrop diecut cut from the Spring Fling 6x6 paper pad. I diecut my flower pieces from Cilantro, Sticky Note and Fake Tan cardstock and inked the edges with lightly darker shades of Distress Oxide inks. I layered the flower pieces together using foam tape between each layer for dimension. I stamped a sentiment from the Wavy Sayings stamp set onto a Fancy Wavy Banner diecut, and popped that up over top of a banner strip of floral Spring Fling paper. To finish off my card, I added a scattering of yellow iridescent sequins and some white gel pen accents. Paper Smooches February Release Blog Hop!